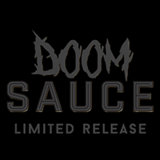 Doomsauce is what happens when Boomsauce takes a walk on the Dark Side. We start with the already amazing Boomsauce recipe and work some dark malts into the process. This produces a mind bending vision to taste sensory experience as you see the darkness, expect a hit of coffee and roast, but instead get heavy citrus and candied orange notes. There is a very subtle dark chocolate character present that works in great harmony with the orange notes. This beer is intended to push the boundaries of perception vs reality and challenge our senses.